Linda Herrington, Volunteer Tutor, and one of her students. The Literacy Council is a volunteer-based organization. We offer tutoring through one-on one or small group sessions (No more than 6 students per tutor). Volunteers and students are matched depending on preferences, language skill levels, and schedules. The Literacy Council only serves adult learners. At the time of writing, the student population is composed of 98% Latinos. Through their lesson planning, tutors address the needs and goals of the students. We do not use a set curriculum. Many resources can be found at the office and staff is always eager to help. There is also a plethora of useful material to be found on the internet. Tutors and students meet a minimum of two times per week, 1.5 hours each time, for a total of 3 hours per week, always in a public place (like our office or the Public Library). Literacy Council students come from many backgrounds but all desire to improve their English reading, writing, or speaking skills. We serve students who are native-English speakers struggling with reading and writing and we also serve students who desire to learn English as a Second (or third) Language. Students attend two - 1.5 hour tutoring sessions per week for a total of three hours of English as a Second Language (ESL) instruction. At registration they are tested to determine their level of language skills and take a pre-test. After 45 hours of instruction, students are given a post-test to measure gain in proficiency. The Literacy Council uses the Comprehensive Adult Student Assessment System (CASAS) as its assessment tool. Tutoring is offered through one-on-one or small group sessions (No more than 6 students per tutor). “It is important for me to learn English to make more opportunities for my life.” - Valente, student. The Literacy Council is open to partnering with you to provide on-site tutoring to your employees. An educated workforce makes good business sense and shows that you care. The Literacy Council can provide instruction directly related to your business needs. If you are interested in learning more, please contact us. We would love to hear from you! Is this mission aligning with your vision for a better community? To continue to provide free services, we rely on the community’s generosity. By supporting the Literacy Council, you are investing in the future of our community. We are a program of Community Action Council and a recipient of United Way. We are a small program with one full-time staff member and two AmeriCorps volunteers. Most of our funding goes to directly support our students. In Chelan and Douglas Counties, 16% of adults lack basic literacy skills. The Literacy Council is working to change that. 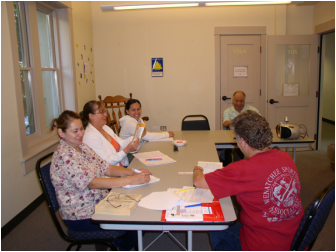 We offer motivated adults free, volunteer-led literacy and English as a Second Language classes.